After the Concert Special, the next Epiphone going up the line was the Deluxe. 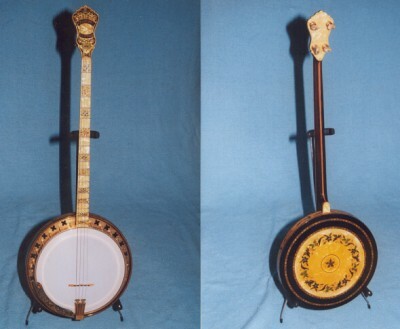 Although considered a "middle of the line" model, it was one of the most ornate banjos they produced. 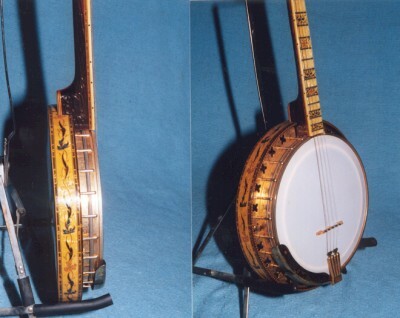 It is today considered a very rare banjo and quite elaborate. The one pictured here (serial number 6794) was produced in either 1928 or 1929. 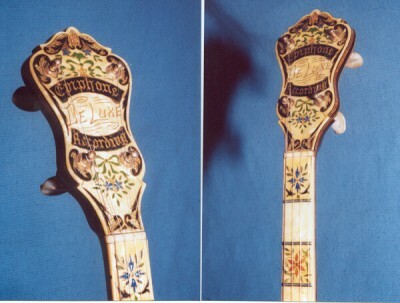 The neck is of Gabon ebony, with the heel hand carved in a beautiful floral design. The fingerboard is of white Pyralin, hand engraved, and tinted in various colors. 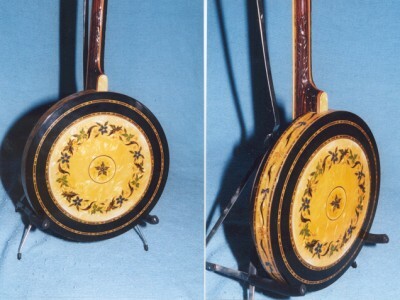 The top veneer of the resonator is of two segments of black and white Pyralin, separated by lines of many colored wood marquetry. The mother of pearl Pyralin is engraved with a beautiful design, and tinted in variegated colors. The metal work is highly engraved, hand burnished gold.